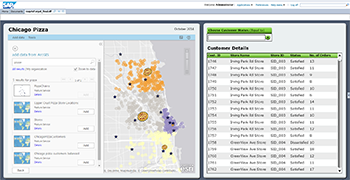 Create maps that interact with other components in your dashboard, and combine published geographic data from ArcGIS with SAP BusinessObjects business data for richer analysis. Note: Esri Maps for SAP Business objects has moved to Retired status [PDF] and is no longer available for download. 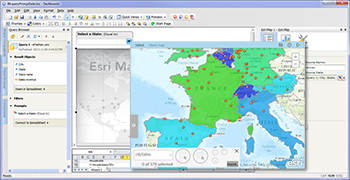 If you have already downloaded Esri Maps for SAP Business Objects, you can continue to use it. Read more about its product lifecycle support status. With Esri Maps for SAP BusinessObjects, you can easily map your SAP BusinessObjects data, whether it's stored in a universe or in the dashboard's embedded spreadsheet. 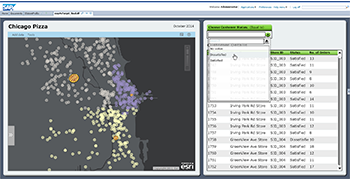 Esri Maps for SAP BusinessObjects works directly with your ArcGIS subscription, allowing you to search for content within your organization and other public content published by the GIS community. Adding data from ArcGIS is a quick and easy way to complement your existing SAP Dashboards data. You can quickly add interactivity between components in your map-enabled dashboard by configuring selectors. A map configured as a selector lets users dynamically update other dashboard components by selecting features on the map. 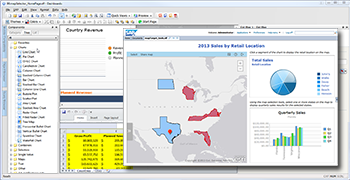 Esri Maps for SAP BusinessObjects lets you configure standard SAP Dashboards components to seamlessly update features on the map based on the user's interaction with other objects on the dashboard.